With so many of our kiddos only doing level 1 or "put in" task boxes, we are constantly making new boxes to keep the kids from getting bored. We have also been trying to use materials that make noise because we have a few kiddos with vision impairments this year. Here are the latest boxes we've made all from cheap supplies from the Dollar Tree or items we already had in the classroom. These are small yo-yo's from the Dollar Tree. They were $1 for 8! They were in the party favor section. These little rattles were $1 for 6! I found them in the baby shower section. They're super fun because they actually make noise! These mini-maracas are great because they make noise too! I found them in the party favor section at the Dollar Tree. I found a whole bag of coins in the toy section at the Dollar Tree. Rubber ducks! I had to buy 2 bags of ducks (there were only 4 ducks in a package) but it was well worth the $2! 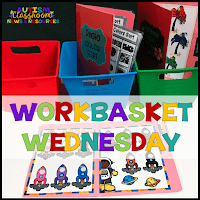 I'm linking up at Autism Classroom News here! What do you use to cut the holes in the top of your bins?